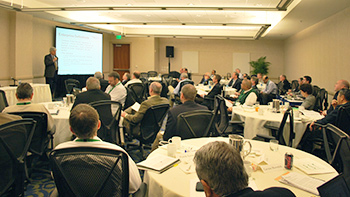 Twenty representatives from fourteen manufacturing companies and nine people from five supplier companies were on hand, along with six government agencies and industry association representatives including the Agenda 2020 Technology Alliance, TAPPI, the US Department of Agriculture-US Forest Service National Forest Products Lab, and others. Fifteen faculty members of the Institute and Georgia Tech discussed recent research endeavors, opportunities and results. “It was energizing to have such a gathering of intellectual horsepower to spend some time talking about ‘the possible, the practical, and the imaginable’, as one member put it,” observed IPST Director Norman Marsolan. 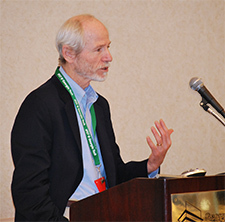 “The conference showcased our broad and deep Georgia Tech faculty expertise, and also leveraged the considerable expertise in the audience." The first day focused on preserving and improving returns from existing assets, with presentations by Professor David Sholl on emerging membrane separation technology and by Professor Preet Singh on advanced techniques to address and prevent corrosion. The changing manufacturing environment due to regulatory requirements, water constraints, and other external demands were explored. 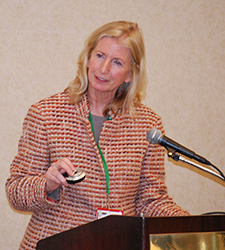 An energy session led off by Nobel Laureate Marilyn Brown and including Professor Deepak Divan reviewed the current policy environment, the tools available to respond, opportunities to take advantage of the industry’s energy self generation and utility requirements for renewable fuels. Department of Energy senior technology manager Bhima Sastri challenged the industry to develop bold ideas for radical reductions in energy demands for consideration for Federal research funding. Day Two moved to opportunities for sophisticated product extensions using fiber modifications and printed electronics, with special emphasis on packaging applications. Professors Art Ragauskas, Bernard Kippelen, and Oliver Brand spoke. Another session, with Professors Ragauskas, Carson Meredith and Mike Harris and moderated by Phil Jones, discussed new products from forest biomaterials and the critical steps required for successful commercialization. Two presentations by Georgia Tech faculty professors William Rouse and Stylianos Kavadias addressed how companies know it is time to transform(and when to defer), and how to balance the needs of the company in place today with the company that management is striving to create.A panel made up of a manufacturer, a chemical supplier, and an industry consultant, moderated by Pat McCarthy of the Center for Paper Business and Industry Studies, discussed economic trends in the industry and steps companies are taking to prosper in today’s markets. 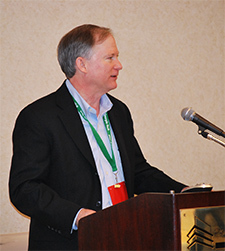 The conference also highlighted IPST’s strategic evolution to meet the needs of the forest products industry today. Founded more than eighty years ago, IPST still strives today to provide members solutions to their strategic, economic, and technical challenges. And today that occurs through a research collaborative that enables access to world-class research personnel at IPST, across Georgia Tech, and globally. Its research thrusts include Operational Excellence, Biofuels, and New Products from Forest Biomaterials. The Center for Paper Business and Industry Studies and the Education platform supporting fifty graduate students complete the portfolio. Key services include focused research(company-directed and consortium), expert consulting, analytical services,and education.